SmashCraft: Tournament and Retro Gaming Gamers unite! Join your fellow gamers for a Super Smash Brothers Wii U tournament with prizes. If tournament play isn’t your thing, check out the Minecraft corner and retro gaming with classics from the Nintendo 64. All ages and walk-ins welcome, but pre-registration for the tournament is strongly suggested. 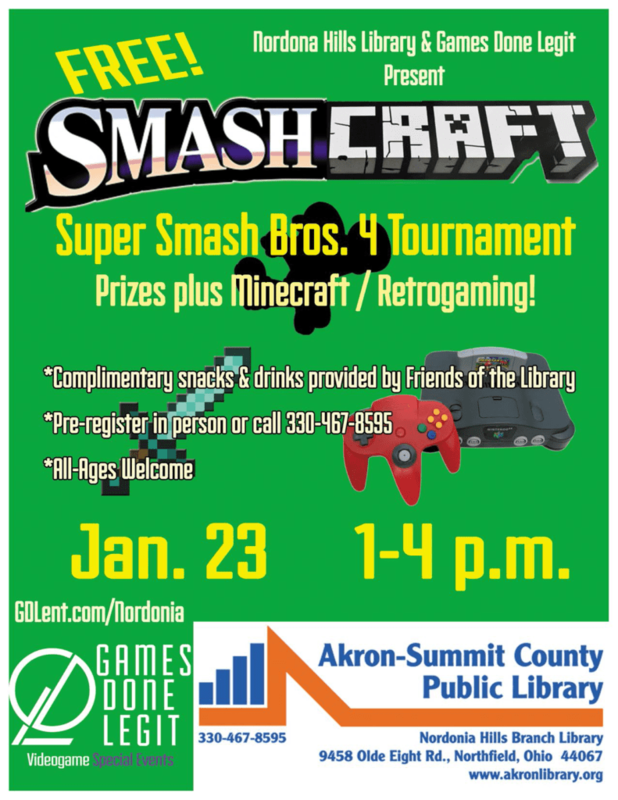 When: Saturday, January 23, 1 – 4 p.m. What: Super Smash Bros. 4 (Wii U) All-Ages Tournament Minecraft 4-player gaming stations Nintendo 64 + classic retrogaming area Free concessions provided by Friends of the Library Cost? Free! Check out the good times from SmashCraft! Thanks to for providing sweet gift cards for our Top 3 winners of Smash 4!